We begin by looking at my new and improved 'Value PPT'. I sunk like 2 hours into this baby getting it animated and awesome. 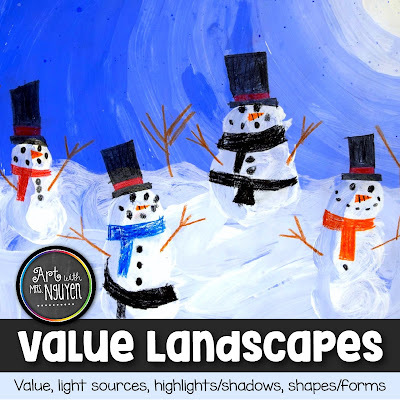 We talk about value referring to the lightness or darkness of a color (and no - when I say value.. I'm not talking about money - the kids ALWAYS answer this when I ask them what 'value' is). 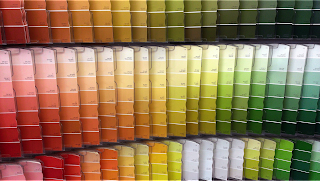 We look at a variety of images showing value scales including a wall of paint chips (which the kids love because they have all seen this before). 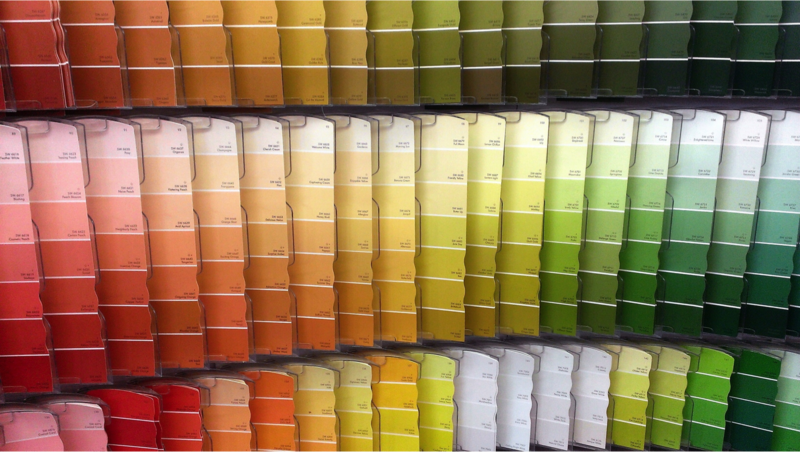 Then we talk about what a "tint" (color + white) is... and what a "shade" (color + black) is. Then I show them an image showing a paper filled with progressively darker concentric blue circles... and ask them how they think the artist created this. Because the circles appear to get darker.. the kids naturally say "the artist created shades!" Ahhh but this one is a tricky one I tell them... because black was never added to the blue! Instead the color blue was added to the color white until it became a pure blue by the time it reached the final outer circles on the page. 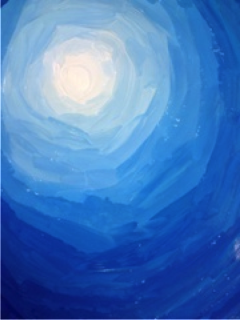 Then comes the awesome animated part of my PPT - I created a bunch of slides which demonstrates how to slowly add blue to the color white to paint progressively 'purer' blues; then I demonstrate in real life. Each set of students gets a paint palette top (the clear plastic circular lids work awesome for holding paint puddles) and a puddle of white and blue tempera paint. 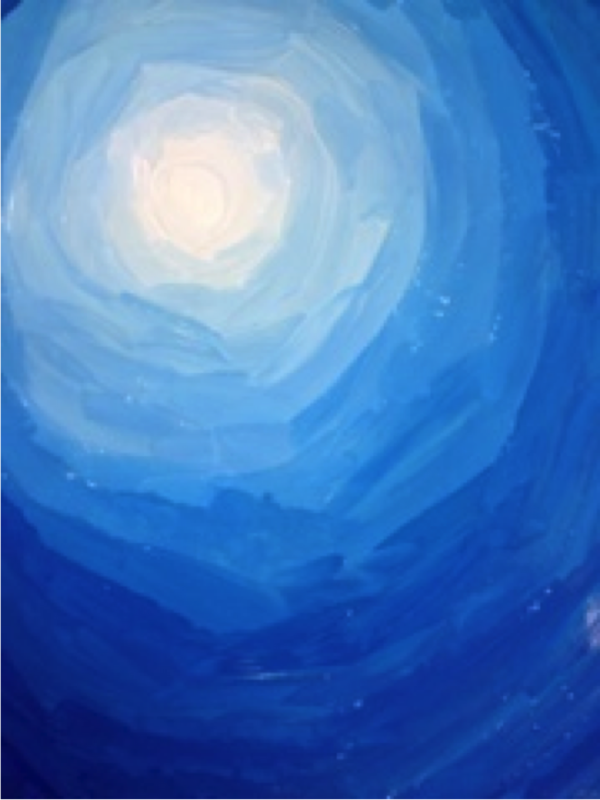 Students then begin by painting their pure white moon in the upper part of their page (exactly where is up to them). Then they dip the tip of their paintbrush into their blue puddle and slowly mix the blue paint on their brush into the white puddle (this creates a very light tint of blue). They use this to paint a concentric circle around their white moon. Then they repeat this process until their entire page is filled with progressively darker blues. Once they are done, our paintings go into the drying rack until the next day! On day two.. we begin by drawing a horizon line on our papers for our winter scene to take place in. We talk about how the horizon line should be further up the page so that we can show a lot of the foreground and middle ground in our pictures. Then they paint this space in with white tempera. The white tempera doesn't completely cover the blue background opaquely.. which ends up actually being a really nice and desired effect as the various streaks of blue helps to create the illusion of depth. Once the white ground is painted, we go back to the projector and talk about what silhouette is (the dark shape of someone or something visible against a lighter background). I then ask students to think about a time that they've seen a silhouette. Lots of my students answer with 'trees at sunset' which is a great answer as it leads us into what we are going to paint next - bare tree silhouettes. 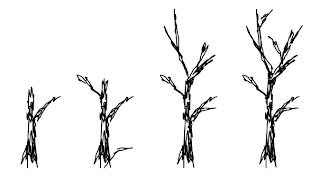 Painting bare trees can definitely be a challenge for all students.. but if you break it down for them and show them what not to do.. it helps them to be a bit more successful with their paintings. 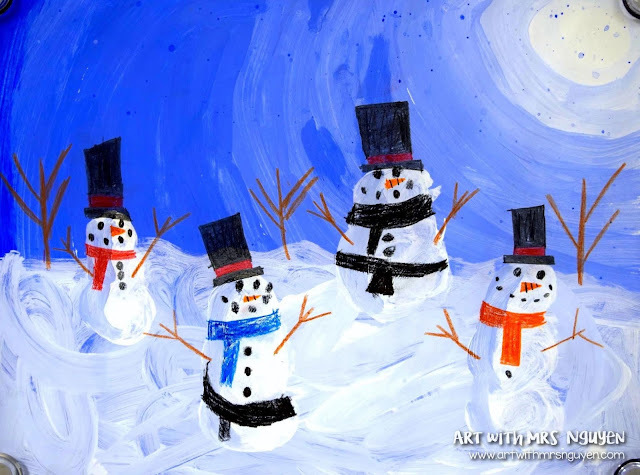 Students practice painting tree silhouettes on a scrap piece of paper.. and then when they are done practicing.. they start adding trees to their winter landscapes. 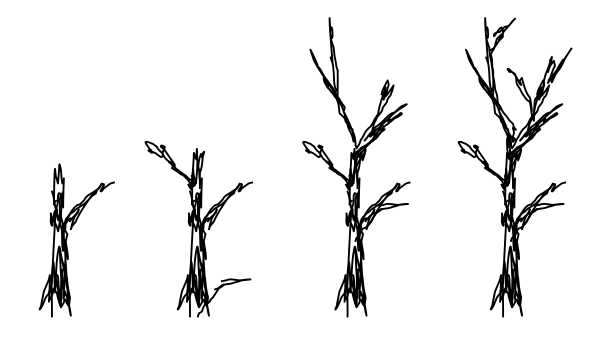 We do also talk about placement on the ground and how trees that appear closer will look larger and will begin closer to the bottom of our page.. while trees that are farther away will appear smaller and will begin closer to the horizon line on their page. 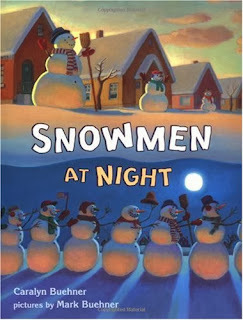 The following day, we begin class by reading the book "Snowmen at Night" by Caralyn Buehner. The illustrations in this book are a beautiful example of how tints and shades can be used to create highlights and shadows on shapes to help give them the illusion of form (like the spheres that make up a snowman's body). We also talk about using a light source (like the moon) to position highlights and shadows more accurately and how shadows on shapes are not always created with black (we examine the picture to the right). 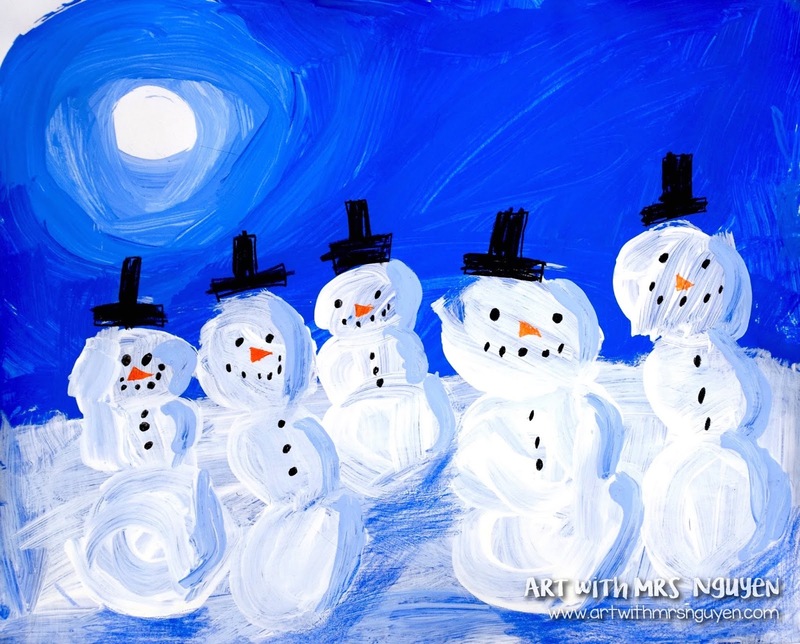 Students then go back to their tables and use white paint to add the bodies of snowmen to their artwork. 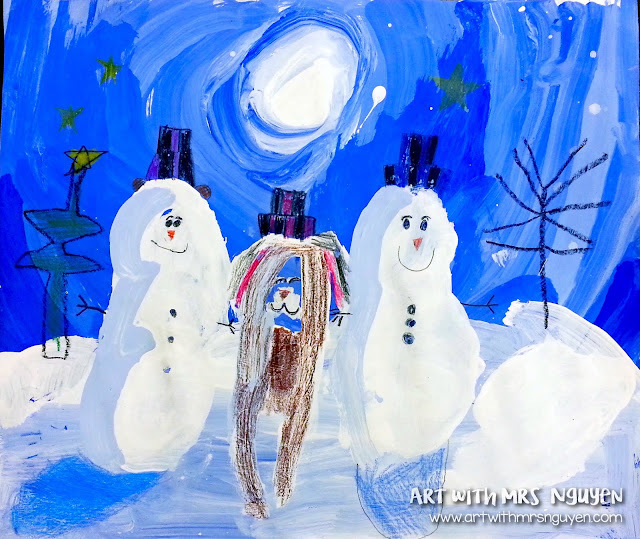 A streak of light blue is added for the "shadow" on the backside of the snowman. Finally, on the last day we begin by talking about cast shadows and details to add to our winter landscapes. 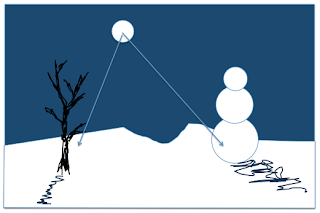 We talk once again about directional light.. and how the light from the moon will cause a cast shadow off of the figures in our landscape (like the snowmen and trees). We then also predict where the cast shadow will fall (based on the positioning of the moon on each students paper). 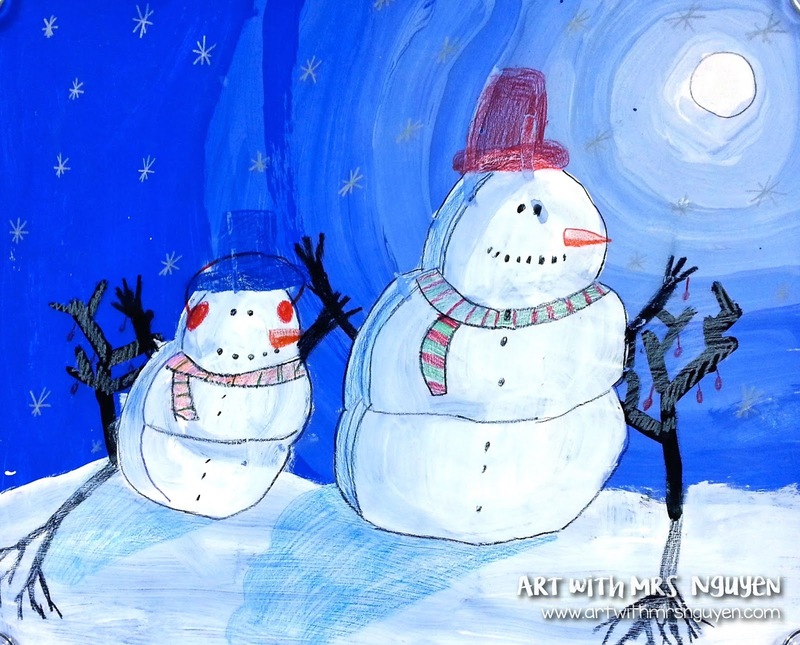 As the students begin adding cast shadows and details to their papers with colored pencils, I read the book "Snowmen at Work" (the sequel to "Snowmen at Night"). 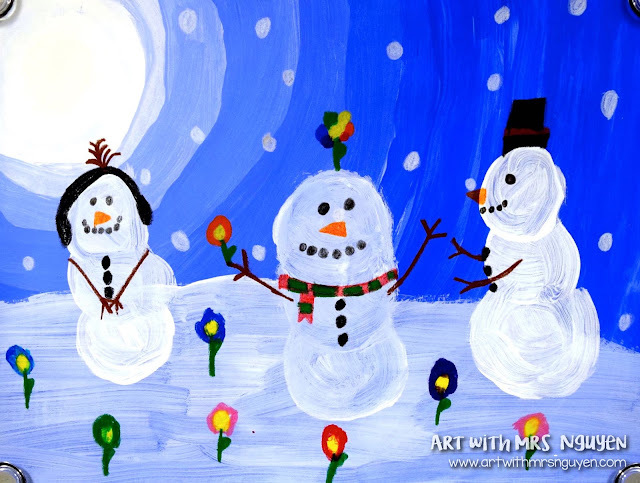 This book is filled with more bright colorful decorative pages of snowmen doing various jobs. It's great inspiration for the kids! 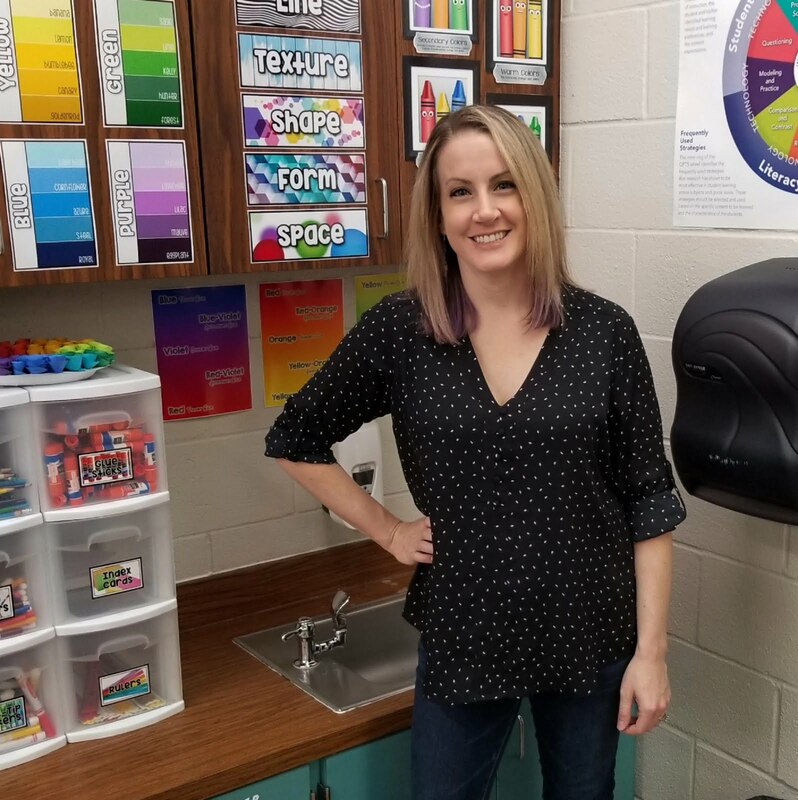 If you are interested in a more thoroughly written lesson with step-by-step teacher procedures, a simplified student handout, and a how to video - check out my store!! Thank you so much for your kind words! :) I truly do appreciate it! I will send you the powerpoint when I get to school tomorrow! These are Wonderful! These addition of the cast shadows really make these pop. I'll have to pin this for next year.Thanks! 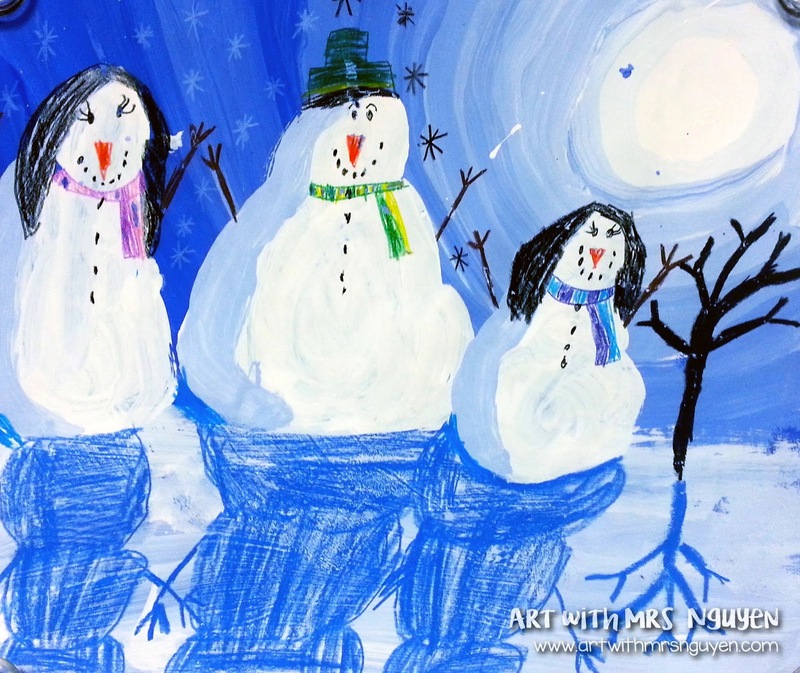 Do you think this art project can be done in one lesson? I really love this but I only have about 1 hour to teach this, do you think it can be done? Also I would love the pp if you are willing to share. What a wonderful lesson! Beautiful- and I love that it has such a clear learning objective- Value! A couple of questions: 1) What size paper did you use? Looks bigger than 9x12, but smaller than 12" x 18". 2) Did the students draw with pencil their snowmen directly onto their background, and then paint white and light blue directly onto the background? Thought maybe the snowman were drawn separately and cut/pasted onto the background. wonderful! are you working on white paper?